If asked what is the one thing, which allows marketers to strike with various age groups, they would reply it is business calendars. Be it a student, teacher, parent or a potential prospect, all use calendars for scheduling their days. This means calendar magnets 7 x6 would easily find appreciation from over refrigerator doors or working cabinets, where they are fixed. Full color calendar magnets are perfect for mailers. There are high chances that they would be retained as a refrigerator art, even after the year ends. Perfect for bulk gifting because many online eCommerce stores offer great discounts on wholesale orders. Sales flyer are not a new promotional item, but they still bear high influence and purpose than many other promotional items regularly sought by marketers to propel their brand name. However, now marketers are slowly gelling up to the idea of sales flyer magnets because they possess high power of retention. People would love to retain them as long as they wish because sales flyers with magnetic backups make a great refrigerator art, too. The business information printed over them will slowly percolate into consciousness of people who see them regularly. This type of promotional strategy suits marketers who are looking for creative ways to catapult their sales and bring maximum exposure for their sales events. They can do it in a very personal way emulating the richness of save the date magnets. Save the date sales magnets are perfect for start up businesses and individual businesses, which are striving hard to gather attention. 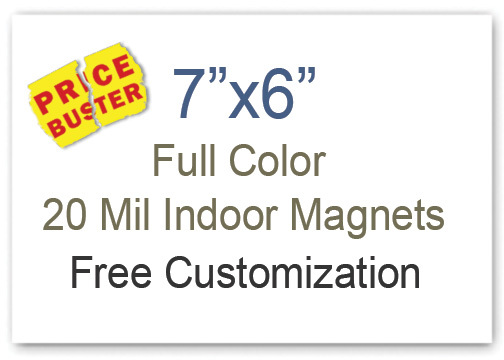 They can strike with people of all ages by gifting individualistic personalized magnets announcing their sale, discount program, brand advocacy program, etc. Can you ask certain people to look and certain others to ignore the big billboards lining up city center. That sounds silly isn’t it? Similarly, you cannot ask certain section of people to view or not to view your business information stretching before their eyes from over 7 x6 magnets. You can only expect them to see it and discuss with others. Seasonal greeting magnets are perfect for businesses, which wish to strike with vast customer segment. Everyone loves to be pampered and they would appreciate, when you send them 6×7 seasonal greeting magnets wishing them for an oncoming holiday or special occasion in life. Perhaps they would think, about your greatness to remember them on time. Perhaps you know that they are bigger than sales flyers and smaller than brochure and people have special fondness towards such promotional items. People would appreciate customized rack card magnets 7 x6 and they would love to retain it for quick reference over easy-to-find places within the home. Gradually this information will percolate into minds of other family members in different age groups. You can find many other ways of impression building using customized 6×7 rack card magnets to a vast and untapped customer segment. The above-mentioned are only keys to grab enriched personalized experiences; you can always explore and expand depending on your choice.